Open Mapping is transforming how governments and citizens work together by allowing them to co-create and support critical government functions with geographic maps and data. The OGP Summit in Mexico City launched Open Mapping within the partnership with a series of successful sessions and gatherings and a critical first of its kind National Action Plan commitment. Read more to understand more how Open Mapping works, how it supports Open Government and the opportunity to incorporate this new approach in upcoming OGP commitments. Open Mapping projects like OpenStreetMap invite anyone with geographic knowledge to contribute map data in an open community. This is a community that cares deeply about quality and use of geographic data, and includes people from all parts of society across the globe, from experts in geographic technologies to experts in their own neighborhoods. This approach has been phenomenally successful at creating maps in under mapped places,serving critical needs, like the response to the Nepal earthquake and mapping wards to support development in Dar es Salaam. The U.S. Government announced their third National Action Plan at the Summit and featured a commitment to support Open Mapping in both domestic and international mapping. Four countries shared Open Mapping work at the Open Mapping Revolution Session. Exploring the details of the U.S. commitment, they shared the MapGive diplomacy program to work with mappers around the world for disaster response. The hosts of the summit shared the open data and response to Hurricane Patricia work within Mexico using OpenStreetMap. France's Etalab shared the national La Base Adresse nationale, combining official and citizen collected data. Indonesia presented preparedness work by BPBD DKI Jakarta for flooding events in Jakarta, in cooperation with OpenStreetMap. All the groups collaborated together during the Mapathon the previous day to do "hands on" open government and map in areas of critical need. Several countries, such as Greece, have made commitments to opening geospatial data. This is an incredible and welcome commitment. Open Mapping goes one step further, offering rich engagement with civil society. Open Mapping communities exist in almost every OGP country and they are eager to make a contribution to benefit Open Government. Please get in touch if you have any questions on how to introduce Open Mapping to OGP commitments in your country or seek connections to your local Open Mapping community. 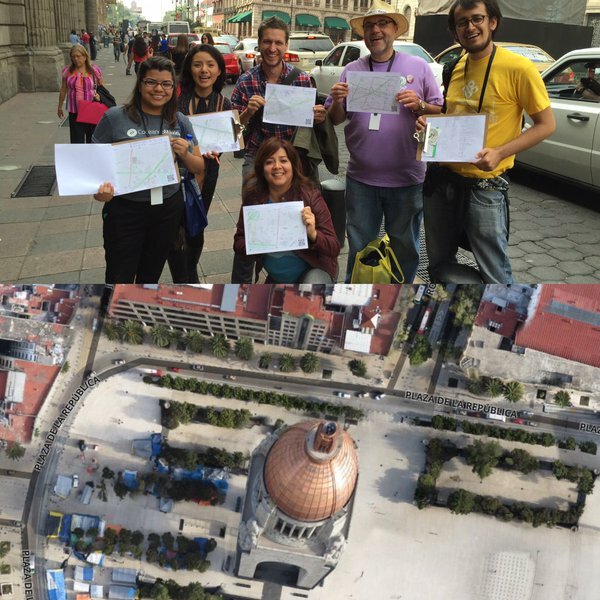 Photo: OpenStreetMap Mapping Party at the OGP Global Summit Mexico City. Photo by Alex Barth.